I love books. I will take any opportunity to read, buy, talk about, gift, or otherwise opine on a wonderful book. So it is with great gleeful glee that I share with you what is clearly the Best Christmas Book of 2013. Santa Calls is a gem. As someone who pays attention to books I’m ashamed to admit that I only recently discovered the luscious joys of William Joyce. And that my pick for the Best Christmas Book of 2013 was in fact, published in 2001 *ahem*. William Joyce is a genius writer and illustrator of the first water. And Santa Calls is a gorgeous adventure that is both captivating and completely original. It starts with a boy named Art. Open the box. Assemble the contents. Come NORTH. Yours, S.C. It sure is. Art and crew go on to have lavish adventures in Toyland. Esther is kidnapped by the Dark Queen. A furious licorish battle ensues. The stalwart band of heroes emerge victorious. 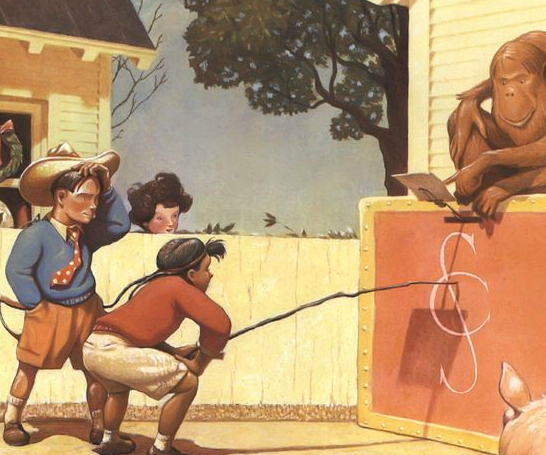 William Joyce’s stories and illustrations are more full of wonders than I ever knew. He doesn’t shy away from story elements that some would typically consider too dark or edgy for kids (this is the second story featuring a protagonist who is orphaned at an early age). It’s a creative and magical adventure where Art and the kids are the heroes, not Santa (who is present but on the sidelines). True to most mythologies, the North Pole is a magical place but the kidnapping of Esther and the Dark Queen give it a much-needed edge. The illustrations are gorgeous with a delightful retro vibe. The dialogue crackles like that of an old-timey radio show. With so many fantastic things going on in this story it’s hard to choose the best, but the standout moment comes on the last page of the book. I won’t spoil it for you but it’s lovely and may induce a tear or two. I’ve written about favorite holiday books before but Santa Calls tops the list. And William Joyce is now one of my favorite authors/illustrators. I likely love these books more than my children and will continue to buy them long after they have graduated to Harry Potter and such. The Man in the Moon (the basis for the movie The Guardians but don’t hold that against it!) is a lovely tale that gives kids a friend that can always be counted on to keep watch in the night. The Fantastic Flying Books of Mr. Morris Lessmore is a heartwarming tale that will speak to any fellow-book lovers among you. It is also the basis for a gorgeous Oscar-winning short animation film, here in its entirety. Anybody else recently fall in love with a book you care to share? Kid OR adult book, I’m an equal-opportunity book lover! Hi! Two things: First, this book sounds delightful so thank you for sharing it. I can’t wait to check it out. Second, re: writing your book, I think you should write it EXACTLY in the same voice as your posts. Most people buy multiple baby sleep books but what makes one standout is being able to relate to the author. I’d rather follow the advice of someone that I’d like to hang out with, than any boring authority. You are hilarious and awesome and I can’t wait to read your book. I feel like when I’m writing Death Eaters (from Harry Potter) are circling around my office moaning, “YOooouuuu Suuuuucckkk!” I have this huge stack of baby sleep books, most of which I hate to varying degrees. And clearly I’m terrified of putting out a book that others will hate. So good notes: don’t be boring authority, do be somebody who gets invited to hang out with. (Probably applies to everything in life ;). That book looks gorgeous! I was hooked with the first sentence. Now I want to go buy it. I love children’s books and cannot control myself around them! I adore William Joyce! I used to work in a children’s bookstore and collected all of his books then. A day with Wilbur Robinson is fantastic if you haven’t read it.